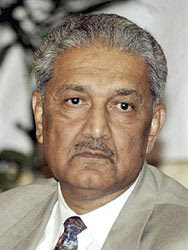 The U.S. and western countries call the threat caused by Dr Abdul Qadeer (AQ) Khan, the equivalent of Adolf Hitler may or Joseph Stalin, for his ability in the nuclear field. Western intelligence never underestimate the ability of Abdul Qadeer Khan. But after thirty years of building Pakistan to have nuclear capabilities, the west and the U.S. feared. Khan then called a broker technology that could endanger the world. The scientist said to have sold the secret nuclear technology to Iran, North Korea, Libya and possibly to other countries. Diplomatic pressure eventually forced the president of Pakistan Pervez Musharraf made Khan under house arrest. The Nuclear Jihadist journey Khan writes in detail. Frantz and Collins husband and wife who wrote it spent four years traveling around the world, interviewing intelligence officials and a former friend and colleague Khan. When the bloody war in 1947, the young Khan left his family in Bhopal India into the Muslim state of Pakistan. The violence seen during the trip and suffering experienced, causing outrage in India. After tasting education in Germany and married a Dutch woman, Khan got a job at a Dutch company related to uranium enrichment. A process for producing nuclear energy, which can also be easily converted into nuclear weapons. Khan mounting. Khan was determined to change the politics of Pakistan as written in his biography, which wants to make Pakistan a very strong and will not experience the trauma ruled India. Fortunate Khan return time from Netherlands to Pakistan along with India's nuclear development. While India has nuclear capability in 1974, there is no reason to ban Pakistan have similar capabilities, should be bombs with bombs. But when Khan walkin in Pakistan, the country's nuclear future is being threatened. Canada has suspended the supply of spare parts for a nuclear reactor at Karachi and France under international pressure to cancel the proposed sale of the processing plant to Pakistan. It opens up opportunities and making Khan as a hero. With the knowledge of his colleagues, he brought blueprints, photos and a list of suppliers. Then with his wife and daughter back to Pakistan to build the capacity of Pakistan's nuclear bomb. He then managed to make a nuclear bomb by the end of 1980 in western expert-estimated. Experts describe Pakistan at that time to make a sewing needle or a good quality bike just considered incapable of, let alone make high technology for uranium enrichment. Jihadist calls Khan black market network building technology for selling Pakistan's nuclear secrets to countries such Iran, Libya, North Korea is also a country that is not known. Jihadist also said Pakistani nuclear scientists met with Osama bin Laden to make bombs.